David Howell Evans (born 8 August 1961), more widely known by his nickname and stage name The Edge (or simply just Edge), is an Irish musician known best as the guitarist, keyboardist, and main backing vocalist for the Irish rock band U2. His distinctive electric guitar timbre and percussive style of playing, along with his innovative use of digital sound processing — delay in particular — have been instrumental in defining U2's unique sound. In 2003, Rolling Stone magazine named him at #24 on their list of "The 100 Greatest Guitarists of All Time". In 1981, leading up to the October tour, Evans came very close to leaving U2 for religious reasons, but he was persuaded to stay. During this period, he became involved with a group called Shalom Tigers, in which bandmates Bono and Larry Mullen Jr. were also involved. Shortly after deciding to remain with the band, he wrote a piece of music that was to become "Sunday Bloody Sunday". The Edge married his secondary school girlfriend Aislinn O'Sullivan on 12 July 1983. The couple had three daughters together: Hollie, in 1984, Arran, in 1985, and Blue Angel, in 1989. The Edge and O'Sullivan separated in 1990 but could not divorce due to Irish laws regarding marriage annullment; divorce was legalised in 1995 and the couple legally divorced in 1996. During U2's groundbreaking Zoo TV Tour, The Edge met Morleigh Steinberg, a professional dancer and choreographer employed by the band. The couple began dating in 1993, and had their daughter, Sian, in 1997, and a son, Levi, in 1999. They were married on 22 June 2002. 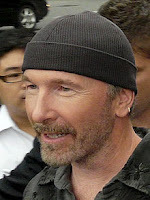 The Edge's hair started thinning in his early twenties, and as a result, he has worn hats or caps on stage, in photo shoots, and on album covers since The Joshua Tree album and tour. From the period of The Joshua Tree up until Achtung Baby and early Zoo TV, he had very long hair. He now wears a toque at all times in public, and even wore one at his wedding to Steinberg in 2002. He has since made very few public appearances without a hat or cap, such as during the 1995 "Pavarotti and Friends" concert where he performed "Miss Sarajevo" and "One" with Bono. This cap has become part of his distinctive "look". As of September 2007 he owned 375 hats according to his most recent count at the time and 14/15 bandanas. He says he has a hat wing in his house. He has also been distinguished by wearing shirts with numbers during the Elevation Tour, and by a cowboy hat and Fu Manchu moustache during the PopMart Tour. He is currently focusing his humanitarian efforts on Music Rising, a charity that provides musical instruments to those who lost instruments in Hurricane Katrina. He also owns the 140-foot, $20 million Codecasa yacht The Cyan.